Please look at the parking lot diagram below showing lane use. 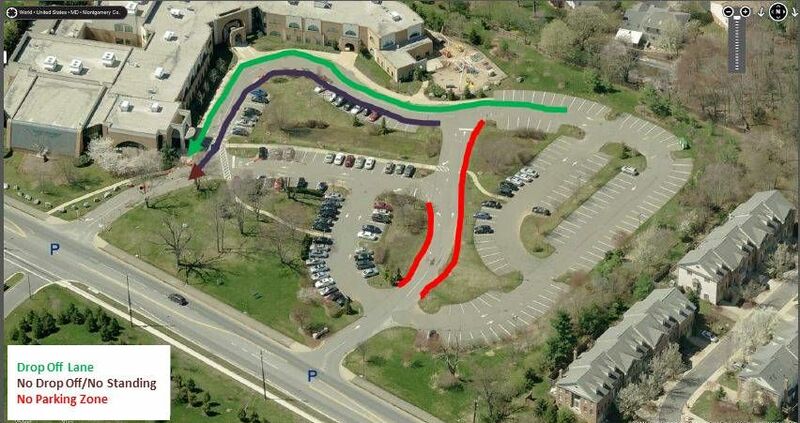 When you are picking up or dropping off children, do not use the red “No Parking” areas as alternative drop-off locations as this creates unacceptable hazards for our children and additional maintenance costs for our congregation. “No Parking” signs will clearly mark these areas. Safety must be our highest priority in the parking lot – even more important than being on time. A large part of the safety of our children depends on every driver recognizing the importance of designated lane use and of No Parking areas. Parking on grassy areas results in passengers exiting vehicles directly into the flow of traffic. Leaving your car in any location that is not a parking place, even for “just a few seconds” to run into the building, creates a hazard for everyone behind you. Above all, please be the most defensive and courteous driver possible. Nearly every week we see a story about a child being injured in a parking lot accident. We have recently had some close calls in our own parking lot. And, while we have been fortunate that we have not had any injuries, it is important for everyone driving into our lot to understand that there are children present, and that they sometimes take an unpredictable path. We do not want the next “Child Injured in Parking Lot” story to be about the Temple Beth Ami lot. Thank you for your continuing concern for our families and support of our congregation.